The issue 'diaspora' is seeing a revival in political discussion today. One of the factors determining this revival is the debate on improving the chances of integration for migrants; another one is the discussion on the challenges arising from the increasing influx of people from poor countries and regions of crisis to the bastions of wealth in the North. An additional factor, namely the impact diaspora can have on the economic development in the home countries, has been brought into the focus of research. At the same time, the question “which role can diaspora movements play in their respective home countries at times of conflict” is asked more and more often. Mainly, there are two different lines of argument: One argues that the influence of diaspora groups aggravates the conflict in their home countries as they either directly or indirectly support parties to the conflict in logistic or, in particular, financial terms. The other assigns diaspora groups a potential to reduce conflict and points out, for instance, that they foster democratization processes or can contribute to a positive economic development of their home country by transferring money or knowledge home. 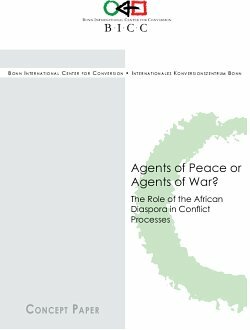 This concept paper was commissioned by the MGFFI with the Bonn International Center for Conversion (BICC) to serve as a basis for a workshop on “Agents of Peace or Agents of War? The role of the African Diaspora in the conflict process”.